U.S. Consumer Product Safety Commission (CPSC) estimates over 15,000 fires and 20 deaths each year are due to clothes dryers. Your dryer’s lint trap serves a critical safety purpose – to keep lint away from areas where it can spark a fire. Simply removing lint is a good step, but it is not nearly enough. Despite your best efforts, debris will accumulate. You need to periodically clean the dryer lint trap. In this video, Raina shows you how to use items you have in your home to clean the lint trap. Studies show people spend 685 hours a year – that’s 28.54 days! – cleaning their home. This statistic makes the case for having a professional handle your house cleaning. Weekly or bi-weekly professional cleanings are your key to an effortlessly clean home. Professionals can handle your “heavy lifting” cleaning, leaving you to only maintain the clean until their next visit. Wouldn’t you like to feel the way our client Judy does? So what’s getting in your way? If you know you need a professional Atlanta house cleaning service but haven’t hired one yet, one of the following myths might be stopping you from experiencing an effortlessly clean hone. This is a uniquely North American myth. 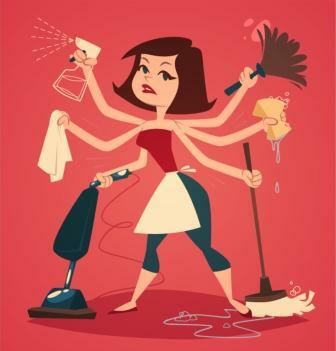 House cleaning services are not just for the wealthy. In fact, in many other countries, middle class families have a full-time housekeeper (and chauffeur) on staff. Imagine – what could you do with an extra 28 days a year?